The retail shopping center was constructed in 1972 and had been originally roofed with a tar and gravel style flat roof common in that time period. Around 1996, the Plaza was re-roofed with a white PVC (polyvinyl chloride) membrane and this roof had done a great job of keeping the shops and restaurants dry but time had taken its toll and the flat roof was showing signs of wear as it neared the end of its life cycle. Teton Corp. is the acting property manager for the owner of the buildings and when the leaks got severe they called Exterior Pro Roofing for an evaluation. The evaluation revealed that the existing roof had reached its 20 year period of service life and in one section of the property the roof was over 21 years old. Exterior Pro made some temporary repairs and informed the property manager and building owner that they needed to begin to budget for a new roof. After 6 months of planning and budgeting the roofing project was ready to begin. The existing roof was a white PVC membrane over a tectum deck. The spec on this job was to remove the existing PVC flat roof and all the flashing and accessories and replace it with new PVC roofing membrane. Also, one layer of 1/2 insulation was to be added to building. The 9 large HVAC units and 8 smaller curbs along with many gas and conduit lines presented many obstacles to roof around. Each morning our foremen would lay out a section of roof large enough to challenge our crews but also manageable so that any area removed could be covered back up by days end. 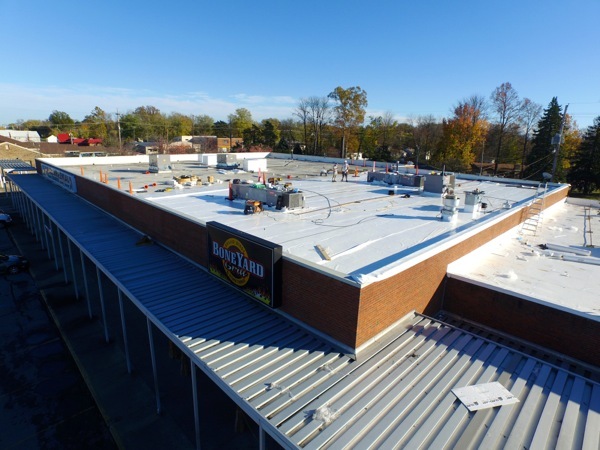 The amount of flat roofing removed and replaced each day depended on the amount of obstacles such as HVAC units, pipes, and gas lines but also on the weather. 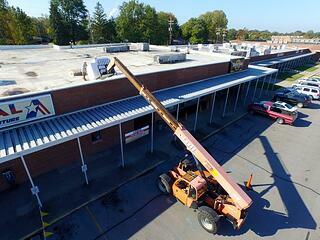 The day began by removing the old rubberized roofing and throwing it into a dumpster. 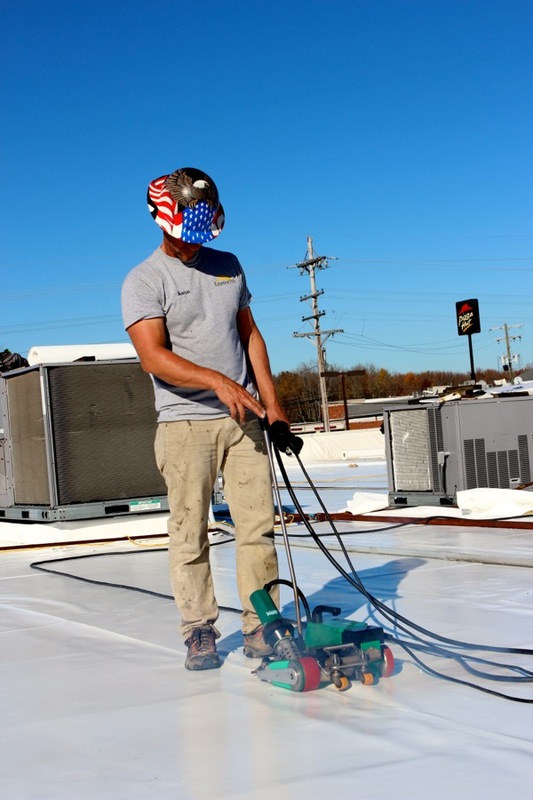 Then, our crews quickly moved to installing the new roof insulation and began to prep the HVAC curbs and pipes for the new flashings. After lunch we began to install the new membrane and then we used a walk behind welder to seam up all the roofing by the end of the work day. 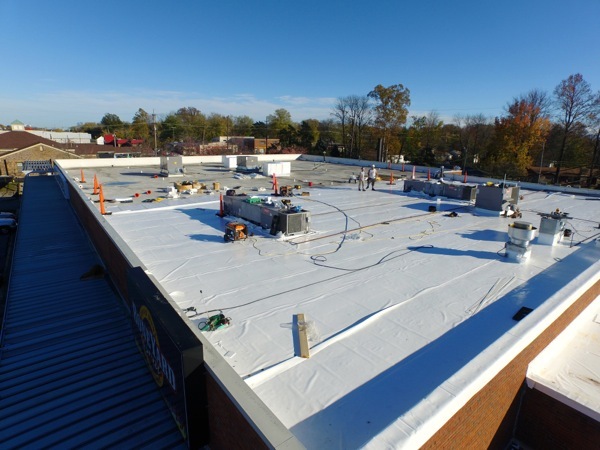 We repeated this process each day until the entire roof was covered with new membrane and dried in. The property manager and owner wanted to reduce maintenance to the property by encapsulating the parapet wall with membrane and then covering the wall with new coping. Not only does this protect the exterior wall and it’s masonry, it adds a clean finished look to the building. The color, sand tone, was chosen as it matched the brick the best. Finally, Exterior Pro installed new through the wall scuppers and collector head boxes to carry the largest amount of water the 42,000 sq. ft roofs collects especially in heavy rain. The weather cooperated on this particular job giving us several dry days in a row which made this job move that much faster. In the end, everyone was happy including tenants, the building owner, and property manager. 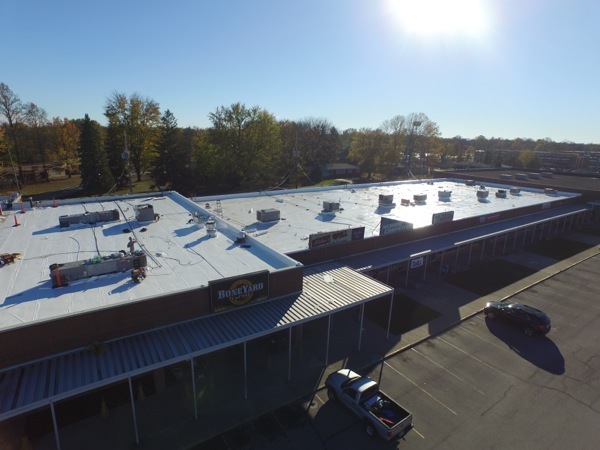 A modified bitumen roof of the Madison, IN Sherwin Williams gets a new flat roof.